A crowd of well over a hundred people gathered in the social hall of Wahiawa Hongwanji Mission on Nov. 21, 2015, to hear the story of a now-gone Wahiawä institution — Honda Tofu. A broken boiler that would have been prohibitively expensive to replace led to the decision last August to close the 98-year-old business, marking the end of handcrafting tofu using traditional techniques that had been handed down for three generations. The Wahiawa Historical Society commemorated the milestone by honoring the Honda family with a festive gathering that featured homemade refreshments, Honda Tofu T-shirts for sale, ‘Ölelo Community Television programming coverage, a sophisticated audio-visual setup and a lively talk story session. 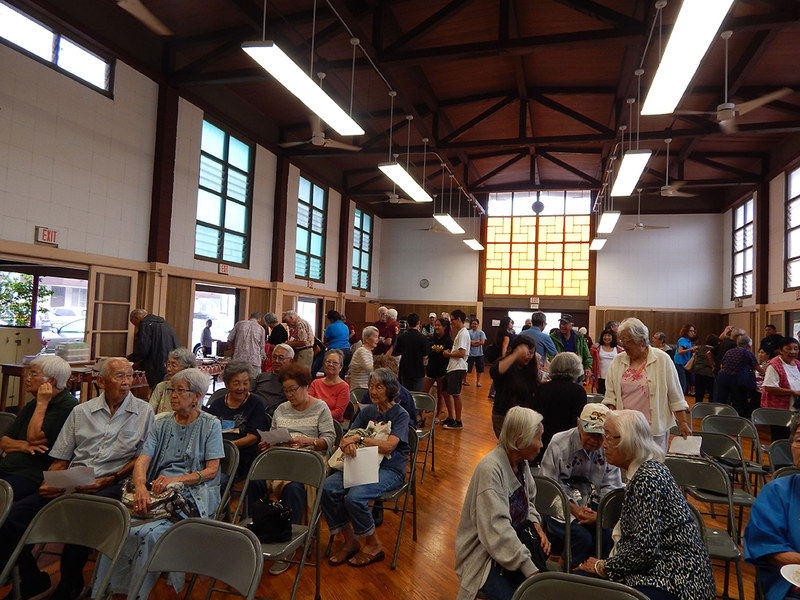 The overflow crowd mingles in the Wahiawa Hongwanji Mission social hall before the event. panel discussion that featured Sadao Honda, second generation proprietor (1948 to 1950); Josephine Honda, wife of Haruo Honda (Sadao’s older brother), who ran the business with her husband from 1951 to 1979; and Dennis Honda (Haruo’s son) and his wife Dulcie, co-proprietors from 1979 to 2015. Kanemaru peppered the discussion with wide-ranging questions designed to elicit nostalgic stories about the former plantation town. Sadao, a 92-year-old retired Wahiawä dentist, opened the session by recalling the founding of the tofu business. His father, Eizo Honda, immigrated to Hawai‘i from Kumamoto, Japan, as a contract laborer with the Oahu Rail & Land Company. Eizo had been a private in the Imperial Japanese Army and fought in the Russo-Japanese War. Tsuyo Morikami, also from Kumamoto, arrived in Honolulu on Christmas Day 1908 as his 22-year-old picture bride. On the night of her arrival, she partook in a lavish Christmas dinner and marveled at the healthy appetites of Hawai‘i’s people. Sadao said his mother called Eizo “moloha,” meaning “lazy” in Hawaiian. She said that whenever OR&L came looking for laborers for overtime work, Eizo would hide so he couldn’t be called. As the eldest son, Eizo was supposed to take over his family’s farm in Kumamoto. Instead, he chose to seek a better life in Hawai‘i. Sadao, my father, always said that this was the best decision of Eizo’s life, because had he stayed in Japan, all of his sons would likely have been conscripted into the Japanese military and killed in World War II. Instead, nearly all of them served honorably in the U.S. military: Robert Yoshiharu with Merrill’s Marauders in Burma; Mitsuo, who earned a Purple Heart, with the 442nd Regimental Combat Team; Sadao and Setsuo with the Military Intelligence Service during the Occupation of Japan; and Stanley Takeo with the Military Police in California. After Eizo fulfilled his contract with the railroad company, the family moved to Wahiawä in 1914. They took over a general merchandise store on Mori Lane with a small tofu factory in the back. Tofu sold for a nickel a piece in those days. Honda Tofu’s humble beginnings took root in 1917 as one of Hawai‘i’s oldest tofu factories. In those days, there was no refrigeration, so the tofu produced that day had to also be sold that day. Any leftover tofu had to be thrown away or sold to a pig farmer, who also picked up the nutrition-rich pulp by-product called okara, or kasu. During the Depression years, Eizo extended a lot of credit at his general merchandise store and eventually had to give it up. The tofu business, on the other hand, was “cash-and-carry” and much more profitable, so Eizo and Tsuyo concentrated on making tofu to support their nine children. 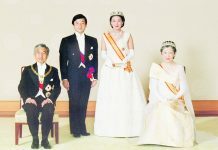 The two eldest were girls, Kiyoko and Kimiko, followed by seven boys: Hajime (who died at age 4), Robert, Haruo, Mitsuo, Sadao, Setsuo and Stanley. Sadao says a typical dinner was leftover tofu, a can of deviled ham and rice. On a family member’s birthday, everyone got one popsicle. of World War II in 1941. In 1943, a Mr. Matsuzaki started making tofu. When he stepped down in 1948, Sadao took over. At least one Honda Tofu customer, a restaurateur, praised the new, fluffier aburage and tastier tofu. Until this time, 90 percent of the tofu was peddled house-to-house in Wahiawä and to many of the faraway pineapple camps. Sadao said delivering tofu turned out to be a great experience for him because that is how he met his “beautiful bride.” While delivering tofu and aburage to Sekiya Delicatessen, another longtime Wahiawä business, the Sekiyas’ eldest daughter, Jean Kisako, was working in the restaurant and caught his eye. They began dating, going to movies and Chicken Griddle Restaurant in Honolulu (where, my father says, he used to leave a generous 50-cent tip). They would sometimes stay out until midnight, only hours before Sadao had to get up and start making tofu. In 1950, a fire broke out as Eizo was deep-frying aburage, forcing the closure of the factory on Mori Lane. Rather than shut down the business for good, son Haruo and his wife Josephine stepped in and saved it. They relocated the factory to 117 Mango St., and incorporated the business as Rural Food Products, Inc. Sadao, who was heading off to college on the Mainland on the G.I. Bill, remained behind for a year and helped them design and modernize the factory. He also showed Haruo the delivery routes, as Honda Tofu was now being distributed to markets throughout the rural communities and was being used by many okazuya and restaurants. At this point in the panel discussion, Jared called on Gay and Calli Chinen, Dulcie Honda’s sister and niece, respectively, to talk about Haruo’s and Josephine’s co-proprietorship of Honda Tofu. Haruo started work at 5:30 p.m. and made tofu until 6 a.m. the next morning. Deliveries were made between 8 and 11:30 a.m., and then the workday would start all over again at 5:30 p.m.
Haruo met Josephine Yojo in 1946. They married and became partners in the tofu business. Josephine also obtained her insurance license and opened her own office, also at 117 Mango St. She was an insurance agent and notary public for many years until she retired in her 70s. But almost everyone in Wahiawä knows Josephine as the “marriage license lady.” According to Josephine, the marriage license office in Honolulu was closed on weekends, so Josephine was chosen to grant licenses because she had her own office and could open on weekends. In 1976, Haruo was injured in an automobile accident and could no longer manage the physical demands of the job, so his son Dennis began the long process of mastering the craft of making tofu. Dennis took over the proprietorship of Rural Food Products, Inc. in 1979, becoming the third generation of Hondas to carry on the tradition started by his grandfather. Haruo continued to greet customers at the shop and remained active with the Wahiawa Methodist Church and Wahiawä Veteran’s Day Parade. By the 1980s, consumer tastes were changing toward healthier products, and tofu, rich in protein, fiber and calcium, was becoming popular. As consumer tastes became more refined, certain connoisseurs of the artisanal product praised the traditional “medium firmness” of Honda Tofu and its fresh soybean taste. The Wahiawa Historical Society event committee — from left: Noelle Sutherland, Ingrid Greene, Grace Dixon, Darrel Takahashi, Bob Lormand, Dr. Jared Kanemaru and Libby Smithe. new heights. Renowned chef and restaurateur Alan Wong, who grew up in the Wahiawä area, began offering Honda Tofu in his restaurants, even mentioning Honda Tofu by name on his menus. Moderator Kanemaru showed a video clip from “Family Ingredients,” an Emmy award-winning food travel show highlighting locally grown and locally produced foods from all over the world. It is produced in part by Wahiawä resident Dan Nakasone. In the clip, Wong takes noted Hawai‘i chef Ed Kenney on a visit to Honda Tofu to sample the soymilk and tofu. Wong and Kenney later walk along Mango Street and discuss the qualities of Honda Tofu in the factory. 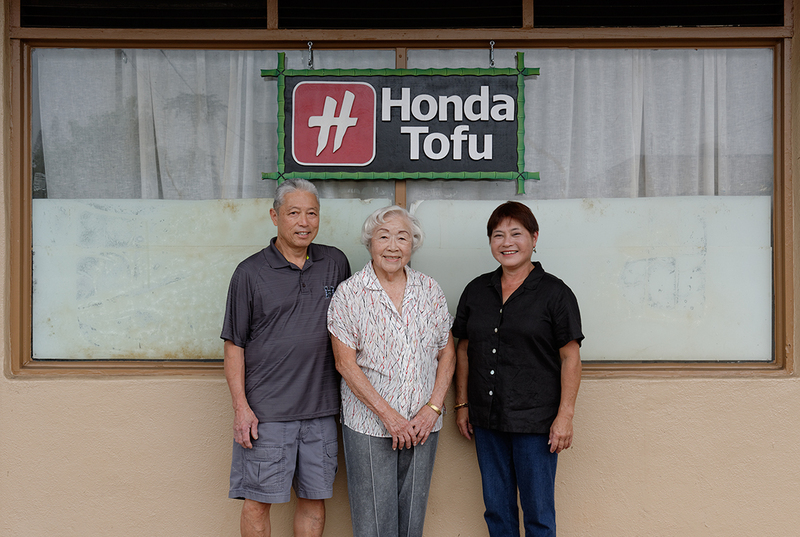 The recognition culminated in 2013 when Dennis and Dulcie were inducted into the Hawaii Restaurant Association Hall of Fame as proprietors of Honda Tofu. Under Dennis and Dulcie, the business also achieved national recognition. Its original hand-painted Rural Food Products wooden sign is now housed at the Smithsonian National Museum of American History in Washington, D.C. During a break in the panel discussion, professional photographer and Wahiawä resident Brian Sato recalled how he helped Dennis and Dulcie move the sign to the museum. Brian shot a prize-winning collection of photographs of Hawai‘i Nisei, which he said he brought to the Smithsonian through Dr. Franklin Odo, Hawai‘i native and founding director of the Smithsonian’s Asian Pacific American Program. Through that connection, Noriko Sanefuji from the Smithsonian came to Hawai‘i, and Brian introduced her to Honda Tofu. 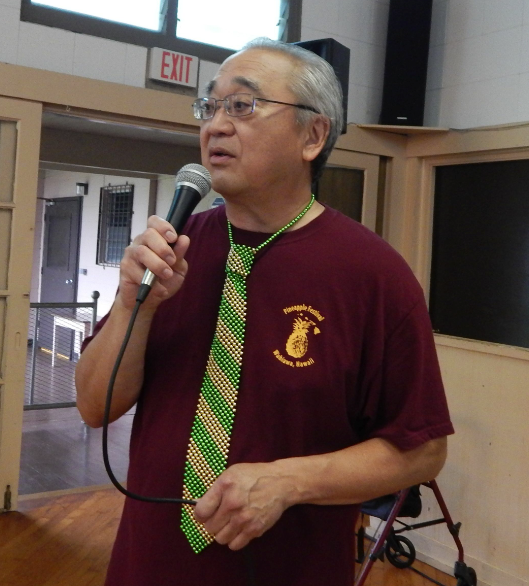 Wahiawa Historical Society president Dr. Jared Kanemaru, sporting a green and gold (Leilehua High School’s colors) tie, opens the program and moderates the panel discussion. Gail Honda is a writer in Honolulu. She is proud to be from Wahiawä and equally proud to be a member of the Honda Tofu family. Gail enjoys listening to and writing about family lore. She can be reached at 808-942-4783 or gail.honda@hawaii.rr.com.